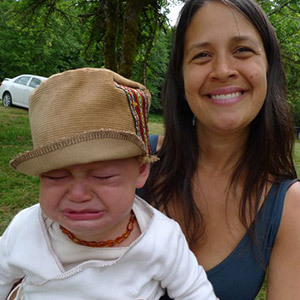 Sometimes baby is "over" being the focus of your attention...especially with pottying! 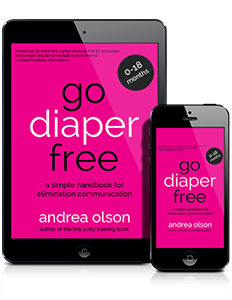 If you've been doing Elimination Communication and things were going smoothly, and all of a sudden your baby is simply resisting, full-force, to sit on the potty (but you're certain that you are paying attention. In fact, you pay attention so much that this SHOULD be working, right? You put aside everything else and make sure his pottying needs are met. You've been damn near perfect and now...it's stopped working!!! )...you might take a look at this new theory I've developed around infant potty training rebellion. I've woven the philosophies of EC & the Continuum Concept together in a way that demonstrates how child-centerdness and infant potty training simply do not mesh. The thing is, if you are making this mistake, you probably don't even realize that you're doing this at all! Okay...so now for the excerpt from my book to learn why babies sometimes resist pottying, why the Terrible Twos exist in toddlers in the first place, and what you can do about it. Like, today. The book The Continuum Concept, by Jean Liedloff, eloquently illustrates how the Yequana people, Stone Age Indians residing deep in the forests of South America, raise their children, emphasizing that what we expect of our little ones determines much of what they do and how they behave. If we expect them to fall, they do as we expected. If we expect them to potty outside, they do. For the Yequana, it's not an emotional battle against children for anything...it's a totally non-adversarial lifestyle. Furthermore, you'll recall that Jean recommends strongly against a child-centered rearing in her book. She goes to much length to prove that child-centeredness leads to rebellion, to a baby who is constantly (& loudly) signaling the caregiver to "give the me the correct experience...show me how to be an adult!" Child-centeredness produces a super-grumpy child. She recommends going on with your life as you did before having your baby, doing grown-up stuff while wearing your baby so he can witness and begin learning what it will take to be a grown-up and contribute to the society he was born into. While doing all this grown-up stuff (shopping, laundry, cooking, walking, socializing, using the toilet, gardening, etc. ), you remain receptive to the signals that your baby (in his little baby carrier, held close to your body) is constantly giving off. This builds your intuition, connection, and awareness, but not at the expense of irritating your child. Jean mentioned that if you sit around and stare at your baby all day, asking him what he wants to do (instead of showing him what "we" do), he will become agitated and start signaling for correction. He is not signaling for more playtime with you, or because he's a "terrible two" or toddler, or because he's a willful, deviant troublemaker...it's because he wants you to show him something interesting by doing something interesting. Within this type of setting, babies are softer, calmer, and happier. When parents EC their babies in countries where the continuum (nature's plan) is honored, they do so matter-of-factly: "This is where we pee. I believe you need to go, so if you do, go here." The book also mentions that babies crave information. So, we can apply this to EC by providing our children with information about where we expect them to potty. We don't plead, we don't persuade or coerce, we don't force...these are all what Jean calls adversarial styles of parenting. We align ourselves with the fact that our babies wish to keep themselves, us, and their dens dry, and we assist them in going when they tell us they need to go (or when it's "time," or when we have an intuition around it). Jean recommends not being permissive, so when baby pees on the floor we express our dismay but do not direct it at the child. We matter-of-factly tell them that this is not the place to go...that over there is. We clean it up without anger towards them. We continue to love the child, but we do not pretend to love the displeasing act. We teach them about right and wrong by reacting to things that displease us in an authentic manner. Jean believed our babies are innately social and that we should expect them to do the right thing, to want to participate and cooperate with us. We don't have to convince them...we just believe. They are born social, and the book states that we mold them into becoming antisocial by our expectations that they will be bad, terrible twos, and other examples of "trouble." By giving babies information about living (and pottying) instead of trying to force, please, or question them about what they want to do today...we give them opportunity to happily contribute to the society they were born into. We pee in the potty. That's just what we do. •Have an "open-door" policy in your family bathroom so your baby can get hands-on, eyes-on experience of what is expected of her in the grown-up landscape." Oh, and if you haven't begun EC yet, but your baby is 0-18 months old, get yourself started here. It's easier than changing poopy diapers, and as you can see from the excerpt above, if you're equipped with the right information from the get-go, it will be a heck of a lot easier!!! So, I am curious to know....How did you get through your baby's resistance to sitting on the potty? What did you learn? Potty Pause Resolution: A deep dive into getting you thru that deplorable potty pause. I started with a toddler, and he has very much resisted the potty over the 2 months we have been doing EC. Basically to get through it we have been trying different places to do business until he has taken to one. We have finally struck gold in the last week, where he will sit on the toilet with an insert (although he resisted this 2 months ago). I learned that I just have to be persistent, and not get down when you go a week without a single catch. I love the Continuum Concept! It took me a lot of pondering at first to let go at times and help more at others. I could do so easily with walking assistance — I had sibling practice! EC wasn’t modeled for me so tapping into the innate “knowing” and not “thinking” took time. It did help that i am a laid back person and have my inner scientist!. Thanks so much for this article. My daughter is 19 months old and we have been doing EC since she was 8 months. It has been going great until she was about 14 months. She is refusing to go on the potty. it gets to the point where she is asking for the diaper. this weekend we started to get her completely potty trained and we found enormous resistance. The more we focus on her going and ask her if she has to go the more she fights. She will stand infront of the potty chair and pee right infront. I will be curious to try the advise in this article. Love this! We started at 2 weeks, and she’ll be 8 months next week. I had no clue what we were doing when we started, and we went from not changing a poopy diaper for 2 months to maybe 2 catches the last 2 months – ever since she learned how to stand and arch her back when I tried the potty. So, I feel like we’re starting over, and I’m aiming for completely diaper free during the day/awake time, maybe even by her first bday (won’t that give the grandparents something to talk about! ), but we’re still sooooooo unsure of how we’re doing things. Hi Nicole! Thanks for stopping by and leaving your comment! This is 100% the case when we begin EC by winging it…and don’t feel bad because I’d say over 2/3 of people do!! All you can do is start with today, yeah? So, I’d do diaper-free time for a couple days, as I’ve advised Sylwia in this post, and put her on the potty every single time and don’t react. Say “pee goes in the potty now.” Do it in mid-pee. Don’t say too many words. The CC recommends being matter-of-fact, and I agree! Sometimes we don’t even realize there’s a “tone” to our voices until it’s already a habit, ya know? Best wishes! Keep us posted!! Wonderful article, Andrea. When our DD (now 13 months) was almost a year old, I re-read part of The Diaper Free Baby (and also posts on the Yahoo EC group) about letting our LOs initiate more of the EC process themselves. This really helped diffuse some of the resistance we had been getting at times. My assumption is that DD experienced this as a sign of our trust in her and her knowledge of her own bodily needs. We sometimes still have misses yet we’re all more focused on living life than on pottying which makes all the difference. Hi Shonnie!! Great to see ya over here….I recognize you from the Yahoo group :) Thanks for your thoughts and experience. Transitioning from all-potty to just living life is KEY!!! Glad you said that. So what exactly did you do to give a baby that young more ownership of the process? Would you be willing to share specifics? I think the primary thing was to ask her less often if she needed to potty. We still ask it if we really think it’s time, if we’re planning to head away from home, or if she’s given the potty sign but we’re not sure that’s what she meant (our “outside” and “potty” signs are almost identical). We also don’t physically place her on the potty; that’s her job with our support (we put her on the toilet and also hold her when doing nighttime ec). We talk about potty when potty is going on, but otherwise we focus our energy and awareness on other things we do, which I believe helps her know that she needs to tell us when she needs to potty since it’s not the only thing we’re paying attention to. Awesome Shonnie! I love what you are doing with your daughter, and in your parenting. Question: at what age did she first bring herself to her potty? When did she start sitting on her own. Did you or another child have to show her how to ‘mount’ it? :) Thanks! We started using the Baby Bjorn Little Potty at 5 months when be began ec. I’m guessing she first sat on her own around 8 months(?). She hasn’t fully “mounted” it herself yet. If she signals “potty” or goes over to her potty I will set it behind her (touching her calves with the front of the potty) and say “you can gently sit back/down now” so that she actually controls the act of sitting (and standing up at the end when she’s done too). We’re an open-bathroom-door family so she sees us use the toilet and also had been sat on her own potty plenty before she got to take a greater role in the process. i gotta say the resistance does NOT necessarily pass quickly. My son started resisting at 10 months and kept resisting until I gave up when he was 17 months old. I diapered full time for three months and then started potty training. We are 5 weeks into potty training and it’s going alright, I definitely use the philosophy above as much as I can with potty training, but it is not some quick fix by any means. My LO is 11 mo. I am right in the middle of this and it is so frustrating. After a month of resisting facing towards the mirror, it was something as simple as turning him around to face me while he goes. I felt like it was a major turning point of success. Now its started again only a few weeks later. Except this time it’s full on rebellion. This article definitely helps though to dial back my frustrations.